What better way to immerse yourself in an artist’s work than to walk into a space that has been altered in amazing and unexpected ways? 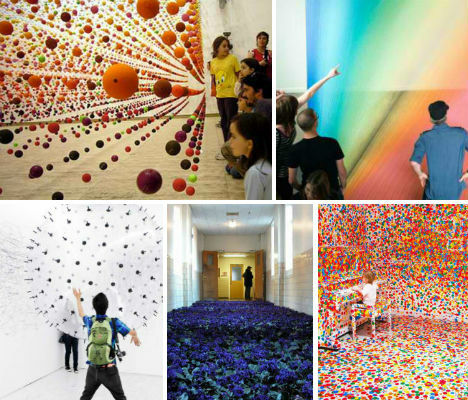 Installation art transforms galleries and other spaces from blank canvases to full-scale, interactive and often surreal environments. These 15 installations range from pristine spaces obliterated by children armed with colorful stickers to complex matrices of metal hangers that jangle with the movement of forty finches. Thousands of balls seemed to hover in midair for the eye-popping installation ‘Atomic: Full of Love, Full of Wonder’ by artist Nike Savvas at the Australian Centre for Contemporary Art in Melbourne. 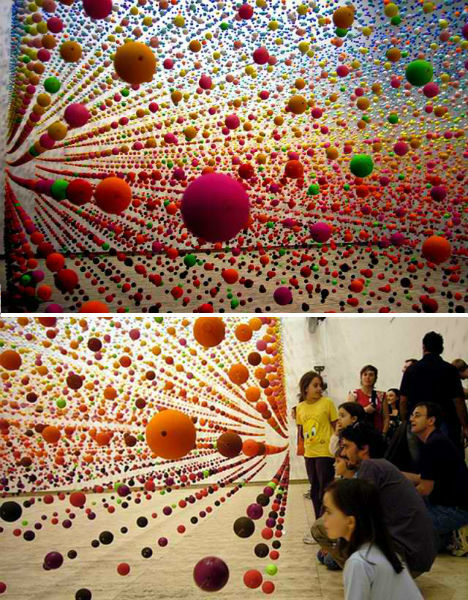 Not only did the installation create a disorienting field of color, but air movement from a fan caused the balls to gently bounce and sway. Hundreds of interconnected metal hangers provided an unusual perch for 40 finches in an installation called From Here to Ear (v.13) by artist Céleste Boursier-Mougenot at the Queensland Gallery of Modern Art in 2011. 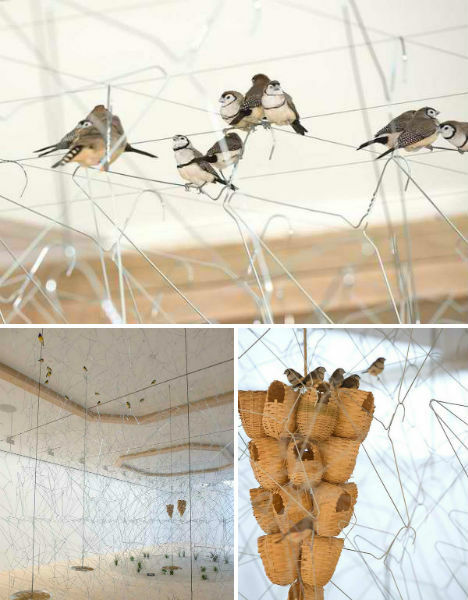 The installation was one of sound as well as visuals, as the movements of the birds caused the hangers to clink together. A giant helium-filled bubble covered in dozens of charcoal nubs was bounced and flung around a white gallery space to create abstract markings on the walls and ceiling in ‘ADA – Analog Interactive Installation’, a sculpture by artist Karina Smigla-Bobinski. Eventually, after the participation of hundreds of visitors, the sculpture deflated and the walls were left nearly solid black. A deteriorating mental health center in Massachusetts was a worn and rather sad place after 90 years of service to the local community. As the building was set to be demolished, artist Anna Schuleit set out to memorialize the building with “a respectful infusion of hope”. 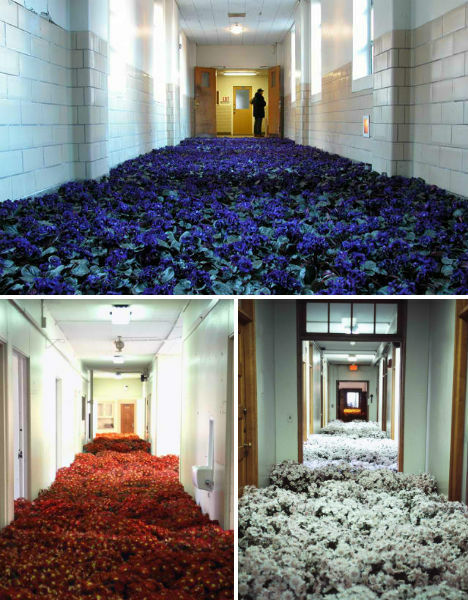 The resulting installation, called Bloom, filled the center with nearly 28,000 potted flowers. The public was invited for a four-day viewing. Read an interview with the artist at This is Colossal. 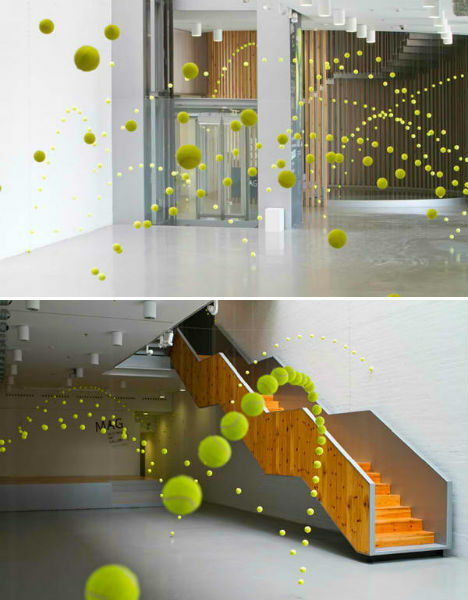 At first, these images appear to be multiple exposure photographs in which the motion of a ball has been captured in its arcs across gallery surfaces. But it’s actual an installation, with hundreds of tennis balls hanging from strings to effectively capture a sense of movement. The work, by Spanish artist Ana Soler, was displayed at the Mustang Art Gallery in Alicante, Spain. 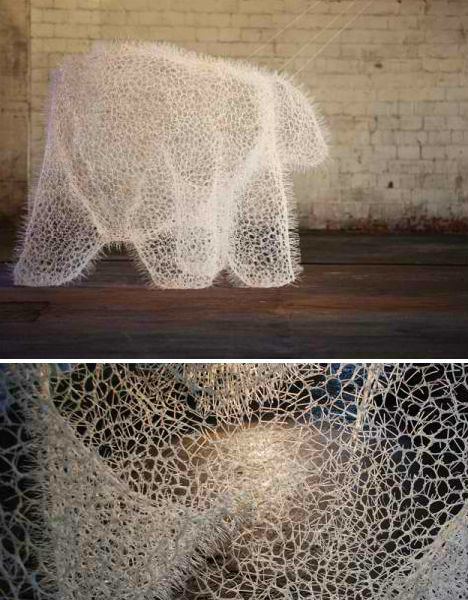 The ghost of some kind of massive animal lurks in a warehouse in this installation by New York Design Office Takebayashi Scroggin, created for the 2011 Beau Arts Festival. Entitled “massimal”, which the firm describes as “design objects that serve as prototypes to examine how physical form can engage the public realm,” the work is made of 20,000 white zip ties. 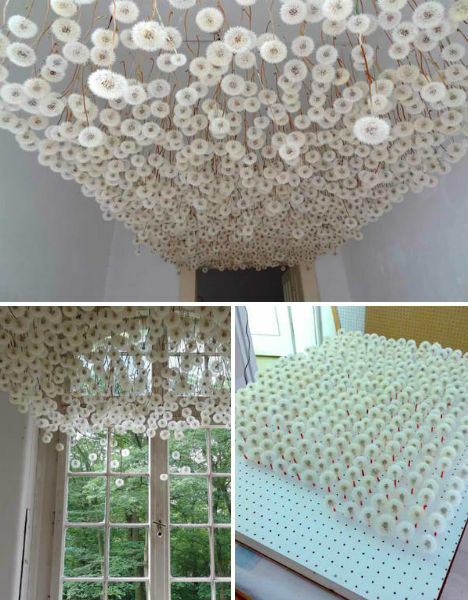 Two thousand dandelions were painstakingly plucked, sprayed with adhesive and loaded into a custom-made wooden transporter so they could be brought to a gallery and hung from the ceiling in a surreal installation by Regine Ramseier. The work was created as part of ArToll Summer Lab 2011. An artificial meadow covers the floor of Artclub 1563 in Seoul, South Korea in this art installation by Zadok Ben David. The work, entitled ‘Blackfield’, changes as you walk from one side of the room to the other. 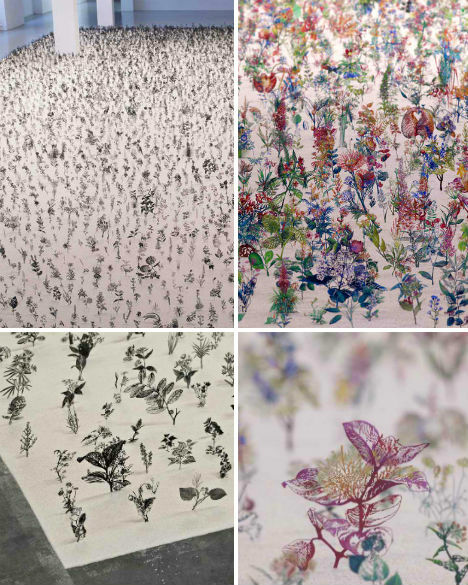 12,000 botanical specimens modeled on textbook illustrations were cut from steel and imbedded in a layer of sand. All black on one side, the tiny plants are revealed in full color from the alternative perspective. 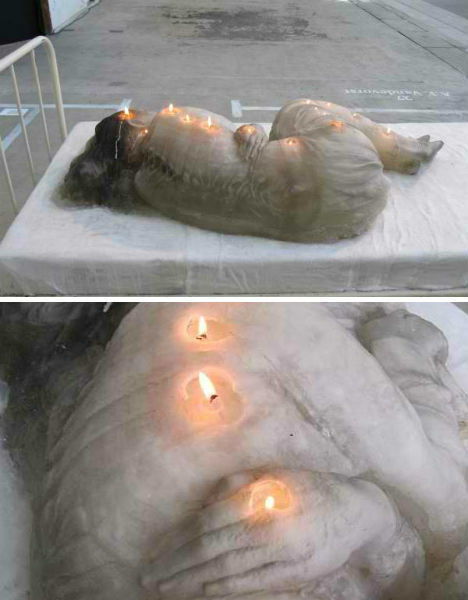 A woman melted before viewers’ eyes at the Arnhem Mode Biennale in 2011. The installation, by artist A.F. 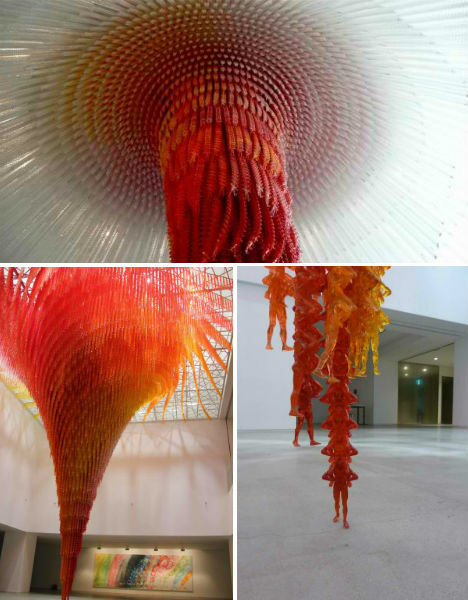 Vandervorst, was comprised of a wax sculpture imbedded with wicks that slowly eroded the woman’s body, drastically altering the shape of the work within hours. A pristine room, with every surface painted a stark shade of white, was completely covered in a chaotic jumble of colored stickers for Yayoi Kusama’s installation, The Obliteration Room. 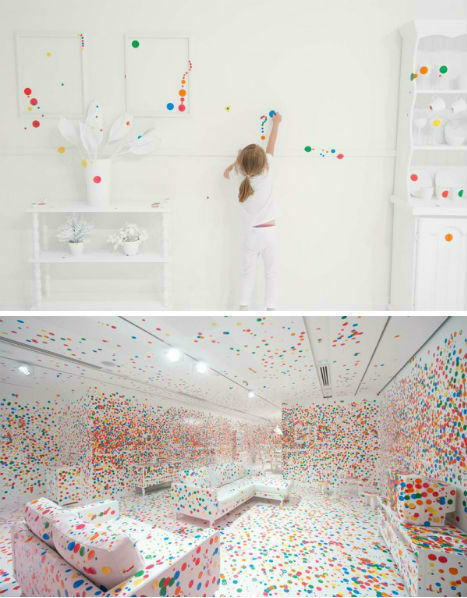 Constructed at the Queensland Gallery of Modern Art, the installation gave the room over to thousands of sticker-armed children over a period of two weeks. By the end of the installation, the white surfaces were barely visible. 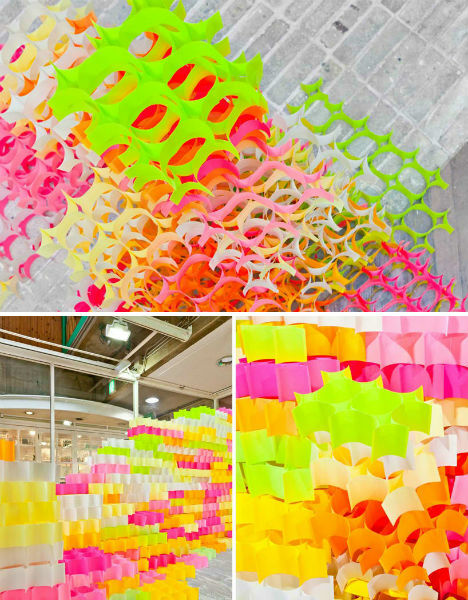 Entire architectural structures were built from nothing more than 30,000 brightly colored post-it notes in an installation called ‘Post-It Structures’ by Yo Shimada of Tato Architects. 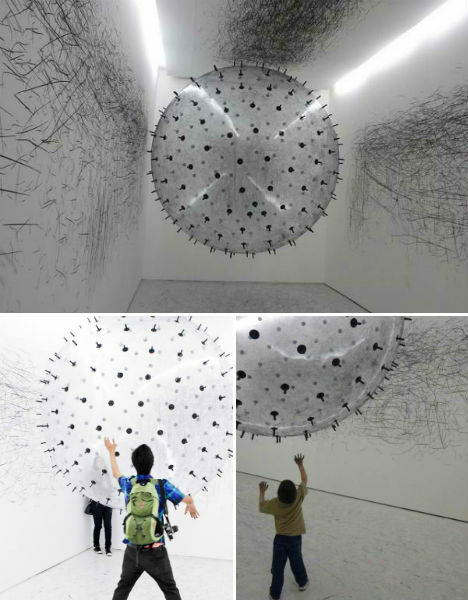 Installed at the Artzone Gallery in Kyoto, Japan, the structures were created by sticking the notes to each other so that they created cell-like shapes. 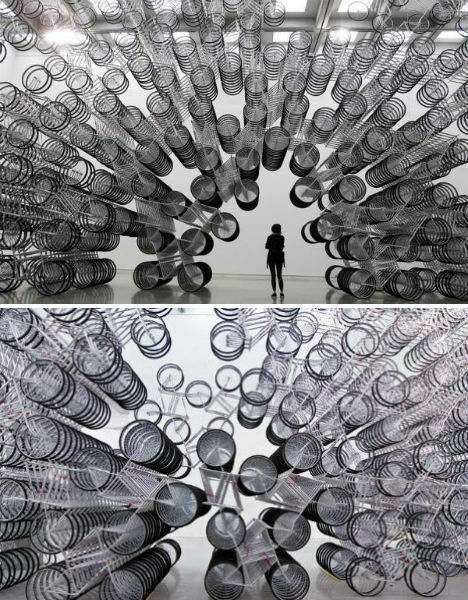 1,200 bicycles were welded together into a gigantic, glittering cavern by Chinese artist Ai Weiwei. ‘Forever Bicycles’ was located at the center of the show ‘Absent’ at the Taipei Fine Arts Museum, the title of the exhibit referring to the dissident artist’s political detention. It looks like an optical illusion – a rainbow created by light and water, perhaps. But Plexus 5 is actually an installation of colored strings, attached to the walls and floor of the Pump Project Art Complex in Austin, Texas. 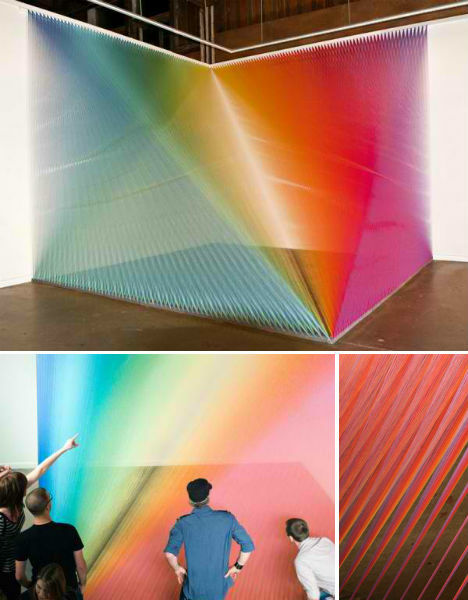 Artist Gabriel Dawe is known for his often-complex string art installations. 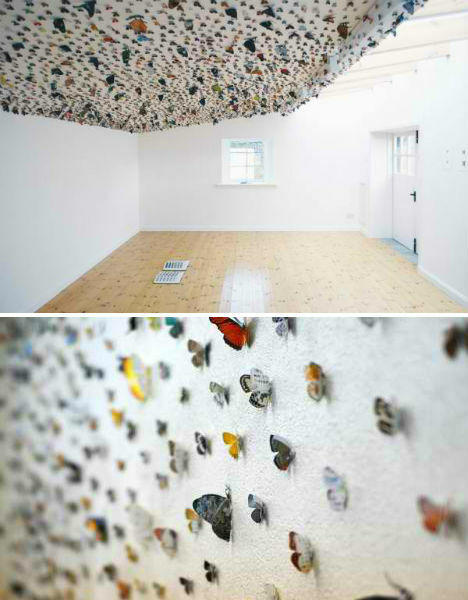 Thousands of butterflies were freed from the pages of field guides and ‘let loose’ on gallery surfaces in ‘A Butterfly’s Eye View’ by artist Eiji Watanabe. The insects were carefully cut from the books and pinned to the walls and ceilings, with the cast-off books left, like cocoons, on tables within each room.